OK, literally ruled by a newborn. I raise a bunch of money by ransoming prisoners. I set up a betrothal, looking 16 years down the line, but am instantly subject to Marta's second revolt. Guess I shouldn't have ransomed her. I use my treasury wisely and am winning that one, when the King of Denmark decides to have another go at Sweden. I think I have to put down the revolt as my first priority. 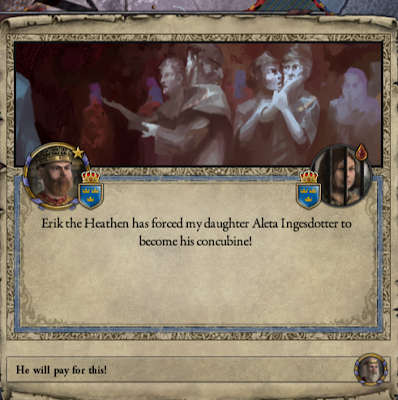 So I give away another county and fight until my treasury is almost gone, but Marta is back in jail. 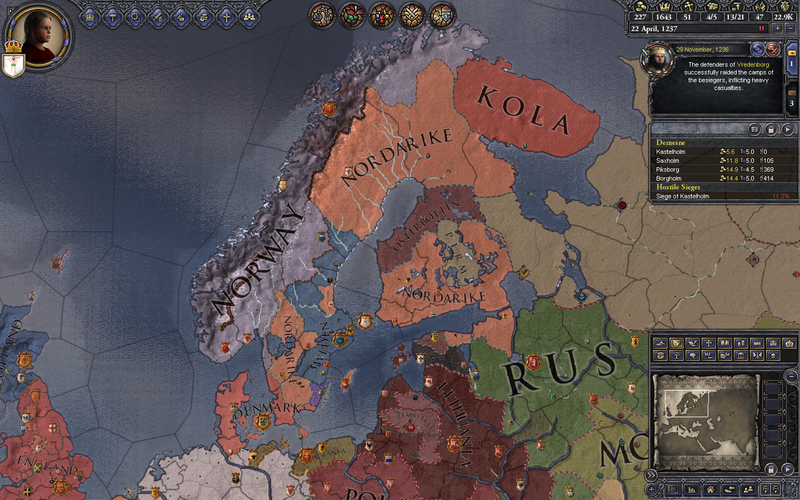 Here I lost some of my updates, but basically, when I was 3, Norway invaded, two people tried to usurp the throne of Sweden and one the throne of Noridarke. I gave away a county to Norway, and held out until I was 10 before my first cousin once removed, Count Bror, took Norway from me, and I was left as Queen of Noridarke. Well, at least I am down to one revolt. For a few months, before I'm up to two. 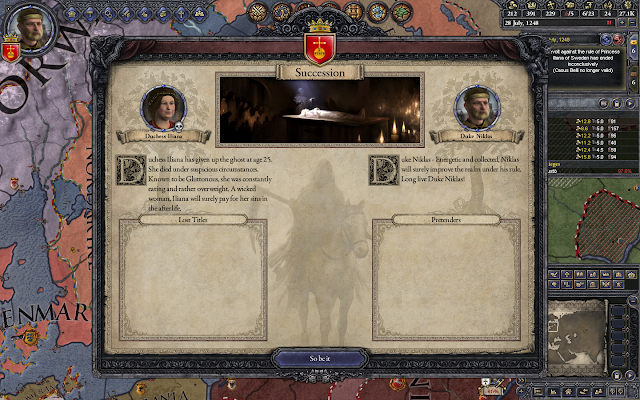 Somehow, I get a white peace offer out of one of them, and I get to put the revolt leader into prison. And, I get another white peace offer. I can try to settle it. Let's take stock of the damage. That's sort of disconnected, but I can offer vassalization to that brown blob to connect the East. 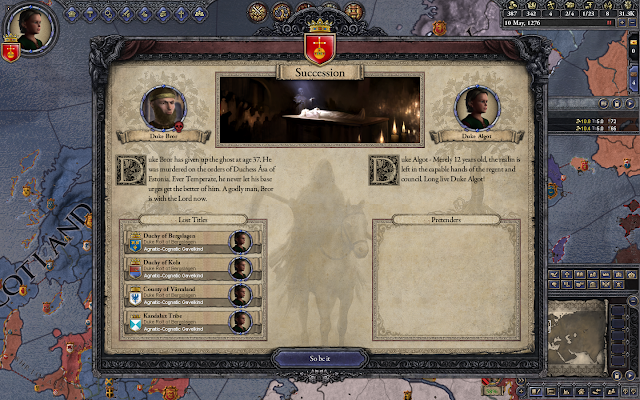 Sadly, at age 14, King Ingemar of Sicily tries to usurp my throne. He is the grandson of Boris I, which I guess gives him the claim. 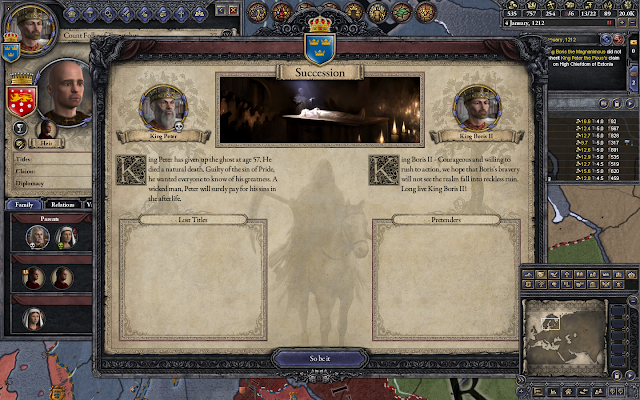 I make it to 17 without losing my kingdom, though I am still imprisoned by the King of Sweden, when the Count of Hedmark declares war on me. And now a Norwegian Duke does too. I divert all of my forces to siege the Count. I win that war, but it'll probably be the last one I manage. King Ingemar dies of "severe stress", so I am down to one war to win. I am losing it, but my surviving troops are about to invade...let's see...Duke Ulfcytel. He's not even of my dynasty, so he has really no business trying to usurp me. Actually, I was about to meet him head on when a count went after me. (I think this was the guy who was trying to put the King of Sicily on my throne.) So I'd better conserve my forces. And...I lose the war. I am no longer Queen of anything. I am Duchess of Uppland, and I am in a Swedish jail. I finally made enough money to ransom myself. Now, I guess I need to see about re-taking my kingdom? OK, first order of business, let's get married and get some heirs. Nobody is available who will help with alliances or pressing claims, so I pick out a guy from Thrace who has a good military background. Duke Heraklios, let's see how things go. Now, I have a chance to build an observatory. That's a new one, and hard to resist. My cousin, Count Niklas of Finland, is plotting to kill me. Let's take care of this one the hard way. Well, that was the hard way. Long live Duke Niklas!